Trump's security costs for one day in NYC equivalent to entire summer in Bedminster, N.J.
President Trump announced on Twitter Friday morning he would work out of his home in Bedminster, New Jersey, this weekend to avoid "causing a big disruption" in Manhattan, a move that "also saves (the) country money." That begs the question -- how much more does it cost to protect the president at Trump Tower New York City than at Trump National Golf Club in Bedminster, New Jersey, suburbs 40 miles away? The answer is, quite a lot, and it's a burden that local and federal taxpayers are sharing. Bedminster Mayor Steven Parker told "CBS This Morning" he estimates the cost for hosting the president in town is $300,000 for the whole summer, based on seven, 72-hour trips. Compare that to the $308,000 per-day cost, on average, to secure Trump Tower and surrounding areas in New York City, according to New York City Police Department Commissioner James O'Neill's February letter to NYC members of Congress obtained by Politico. In other words, it costs more to protect the president for one day in Manhattan, than an entire summer in nearby Bedminster, and that Manhattan price tag doesn't include a $4.5 million annual price tag for the New York City Fire Department to protect Trump Tower. Mr. Trump's high protection costs have drawn scrutiny and even ire, as he racks up taxpayer-backed bills for localities and the Secret Service -- particularly at his Mar-a-Lago club in Palm Beach, Florida. The liberal Center for American Progress created a website tracking when Mr. Trump is at Mar-a-Lago, how much those trips cost so far, and what federal programs that money could fund instead. Added security around Mar-A-Lago during Mr. Trump's visits has reportedly cost surrounding governments more than $3.5 million, CBS News' Don Dahler has reported. But Mar-a-Lago is currently closed for the summer, leaving Mr. Trump to find somewhere else to visit. First Lady Melania Trump and the Trumps' son, Barron, continue to live at Trump Tower until Barron finishes the school year, which has also drawn criticism. More than 550,000 people signed a Change.org petition demanding the Trumps move to the White House, or personally foot the bill for the additional security costs. The NYPD estimated it costs between $127,000 and $146,000 per day to protect Mrs. Trump and Barron while President Trump is out of town, according to the New York Times. "The U.S. taxpayer is paying an exorbitant amount of money to protect the First Lady in Trump Tower, located in New York City," the petition read. "As to help relieve the national debt, this expense yields no positive results for the nation and should be cut from being funded." Congress included $120 million in its omnibus spending bill to fund the president's security -- $60 million for the U.S. Secret Service, and $60 million for localities' policing services. President Trump's expenses for security alone in his first year are on track to surpass the security and Air Force One costs for all eight years of Obama's presidency. According to documents obtained by a Judicial Watch Freedom of Information Act request, the former president's Secret Service costs from 2009 - 2016 totaled almost $97 million. None of the figures for Mr. Trump's security include additional costs for Air Force One. 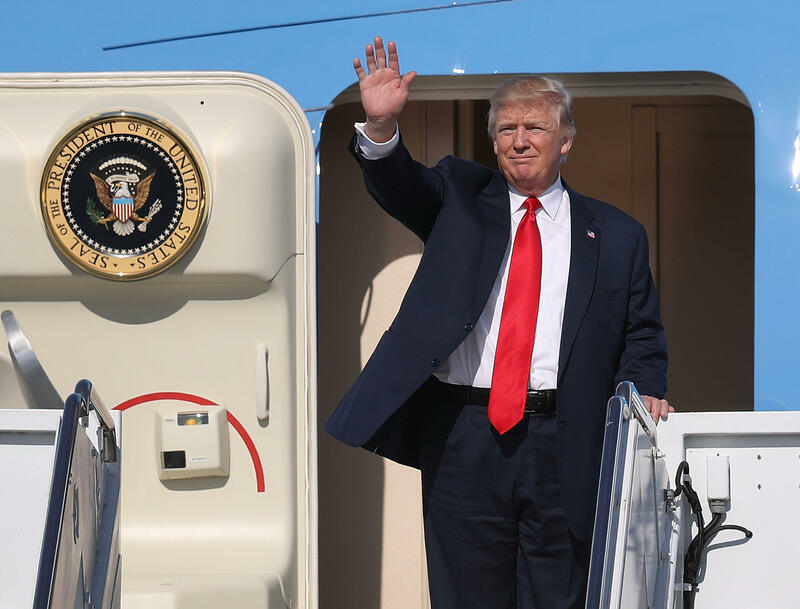 The cost of operating the president's plane for a single hour is $142,380, according to Air Force documents obtained by conservative watchdog group Judicial Watch. CBS News' Don Dahler and Katiana Krawchenko contributed to this report.